Charles Evers has been working as a civil rights activist, businessman, and politician since the 1950s. The older brother of Medgar Evers, Charles Evers earned recognition in his own right as a disc jockey, the first African American member of the Democratic National Committee, and the first African American mayor of a biracial town in Mississippi in more than a century. James Charles Evers was born in Decatur, Mississippi, on 11 September 1922, the eldest of Jim and Jessie Evers’s four children. Jim Evers held a variety of jobs, including stacking lumber in sawmills, working for the railroad, renting property, operating a small farm, and working as a lumber contractor. Jessie Evers supplemented the family’s income by working as a maid. Beginning as a teenager, Charles earned money as a bootlegger. In 1939 Evers left school, lied about his age, and enlisted in the US Army. He was soon discovered and dismissed from the service. Evers then moved to Forest, where he worked in a funeral home operated by his great-uncle. He reenlisted in the army when he turned eighteen and went to Camp Shelby in Hattiesburg. After training at several army bases, he was dispatched to the 334th Engineer Battalion with the Army Corps of Engineers. Evers was transferred to Fort Leonard Wood, Missouri, in 1942 and then was shipped overseas to Sydney, Australia, the following year. He served with a combat engineering unit in Australia, New Guinea, and the Philippines, rising to the rank of battalion sergeant major before being transferred back to Mississippi and mustered out of the army in 1945. Charles and his younger brother, Medgar, subsequently attended Alcorn Agricultural and Mechanical College, where Charles earned a high school diploma as well as a college degree in social studies, though his education was interrupted when he was briefly recalled to the army. He served as class president, played center on the football team, and operated a taxi service for students. He also participated in civil rights work with Dr. Theodore Roosevelt Mason Howard and joined the National Association for the Advancement of Colored People (NAACP) in 1948. Evers then moved to Philadelphia, Mississippi, where he managed a funeral parlor, taught history and coached football in nearby Noxpater, and continued his bootlegging operation. His involvement with the NAACP grew, and in 1953 he was elected the group’s Mississippi voter registration chair. In February 1956 he organized the Philadelphia chapter of the NAACP, but financial problems and threats of retaliation by the Ku Klux Klan forced him to move to Chicago, where he held a series of jobs. He periodically visited the South to assist in voter registration drives and provide financial support to his family. 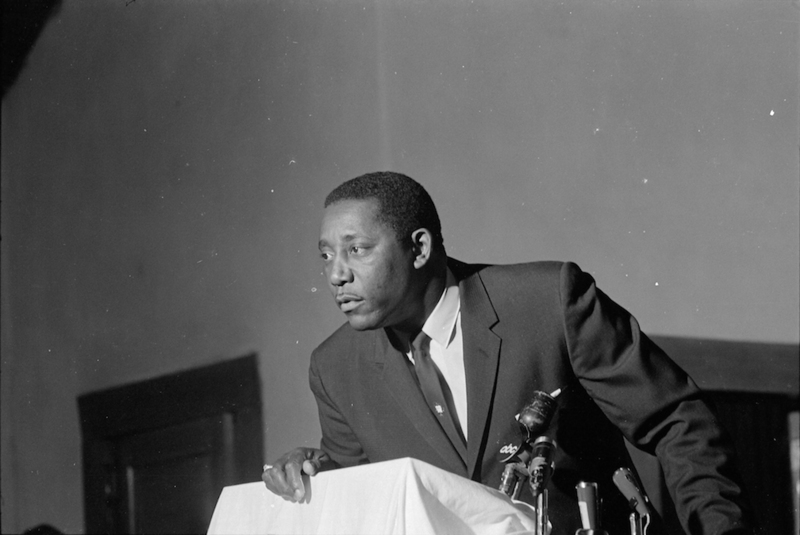 When Medgar Evers was assassinated on 12 June 1963, Charles Evers returned to Mississippi and took over for his brother as the NAACP’s Mississippi field secretary. Evers remained active in the civil rights movement throughout Mississippi and the South, often serving as the NAACP’s representative to other civil rights organizations and helping to run civil rights boycotts in Natchez and Fayette. In 1968 he ran for the congressional seat vacated when John Bell Williams became governor of Mississippi. Although Evers performed well in the primary, he lost in the runoff election. In 1968 he was one of three African American delegates from Mississippi to the Democratic National Convention, but he declined the position when the Mississippi delegation refused to swear loyalty to the national Democratic ticket, including its civil rights plank. Instead, he accepted a position on the Democratic National Executive Committee, the party’s highest policymaking group. Evers returned to politics in 1969, defeating an incumbent to become mayor of Fayette. In addition to his mayoral duties, Evers served as judge and prosecutor, and he further expanded his business ventures with the acquisition of a shopping center, motel, and restaurant. He repeatedly won reelection, remaining in the post until 1989. In 1974 he hosted the first Southern Conference of Black Mayors. In 1971 Evers ran for governor, garnering 22 percent of the vote but losing to Democrat Bill Waller. Evers ran as an independent in the 1978 race to replace retiring US senator James O. Eastland, finishing third behind the Democratic candidate and the Republican victor, Thad Cochran. Evers has written two memoirs, Evers (1971) and Have No Fear: The Charles Evers Story (1997). The federal government indicted Evers for income tax evasion in 1974, but the case ended in a mistrial in June 1975. At the end of his political career, Evers joined the Republican Party. Since 1973 he has hosted the Medgar Wiley Evers Homecoming Celebration, which honors his brother’s life and legacy. He remains active in the Fayette community and has traveled around the globe.